The United States Postal Service (USPS) provides mail services in the United States. In addition to delivering mail to addresses across the country, the USPS also provides customised business solutions and priority services for customers. The agency offers both online and in-person service through thousands of Post Office locations. All mail collected by the USPS are sorted through over 250 Processing and Distribution Centers located across the United States. Individual centres are responsible for sorting mail in a given region, typically within a radius of about 320 kilometres or 200 miles. Each centre is connected with the USPS’s national network. Mail is typically sorted using an automated system, although physical inspection and sorting may be needed when an address cannot be identified by the system. All mail is printed with a bar code that is used to determine the destination as the item moves through the USPS system. USPS Tracking here provides the status of parcels and other mail items with a label or receipt number. Items shipped with Priority Mail Express will include point-by-point tracking details, while mail and parcels sent with other services will only show when an item went out for delivery. Services with label numbers include Certified Mail, Collect on Delivery, Global Express Guaranteed, Priority Mail Express International, Priority Mail Express, Priority Mail International, Priority Mail, Registered Mail, Signature Confirmation and USPS Tracking. USPS Tracking may be purchased online or at a Post Office, depending on the mail class that is selected. USPS Tracking provides additional details that may not be offered with label or receipt numbers alone, for example, when sending Certified Mail or Registered Mail. In these cases, basic information about when an item went out for delivery will be provided rather than step-by-step information as the item travels through the USPS network. USPS Tracking is provided at no charge for Priority Mail, Standard Post, Parcel Select, First Class Package Service and First Class Mail parcels. Charges from $0.23 when paid online and from $1.05 for other types of mail sent with the USPS. 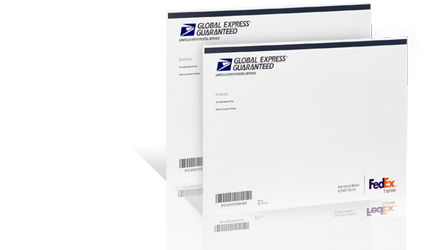 International mailing classes with tracking ability include Express, Express Guaranteed and Priority. Tracking is not available for Priority Mail International Flat Rate Envelopes or Priority Mail International Small Flat Rate Boxes. The first independent postal services in the United States were formed in the North American colonies of Massachusetts and Virginia. The first centralised postal service was created in 1691 with the North American Postal Service, although the USPS traces its roots to 1775 when the first postmaster general was appointed and the United States Post Office was created. The Post Office Department was created in 1792. Originally focused on deliveries in cities, parcel post service between the United States and other countries was introduced in 1887 beginning with Canada. By 1896, postal service delivery expanded into rural areas and the first airmail service began in 1918. The U.S. Post Office was reorganised in 1970 with the introduction of the Postal Reorganization Act. The Post Office Department was replaced with an independent government agency, the United States Postal Service. The USPS began operations on July 1, 1971. The United States Postal Service delivers to nearly 153 million addresses across the country. Approximately 40 per cent of the world’s mail volume is handled by the USPS, which processed 158.4 billion pieces of mail in 2013. The agency also manages more than 31,000 retail offices and a fleet of over 211,000 vehicles. Each year, USPS mail carriers and truck drivers drive approximately 1.2 billion miles. The USPS receives no tax dollars for its operations and is not a government-owned agency. Rather, the USPS acts as a quasi-government agency with the exclusive legal right to deliver first-class and third-class mail. It also has special privileges afforded to government agencies, including sovereign immunity, eminent domain powers and powers to negotiate international postal treaties. According to the Mailing Industry Job Study, 2012, more than 8.4 million jobs and over $1.3 trillion in revenue is attributed to the mailing industry in the United States. The USPS plays an important role in supporting this industry. In 2013, the USPS’s revenue was $67.3 billion and employed more than half a million people. Revenue from First Class mail alone was $28.2 billion, while advertising mail accounted for $16.9 billion. The USPS’s shipping and packaging services contributed $12.5 billion to the agency’s revenues in 2013. If the USPS was a private sector company, it would have ranked 45th in the 2013 Fortune 500 ranking. In the 2013 Global Fortune 500 list, the USPS would have held the 140th position. The USPS is governed by the Board of Governors of the United States Postal Service, which sets policy, procedure and postal rates. Nine of the board’s members are appointed by the President of the United States and confirmed by the United States Senate. These nine members select the U.S. Postmaster General, who serves as the tenth board member. The Postmaster General is responsible for overseeing the day-to-day operations of the USPS and acts as the Chief Executive Officer. The ten-member board also nominates a Deputy Postmaster General to act as the Chief Operating Officer and the eleventh member of the board. The Postal Regulatory Commission is responsible for overseeing postal rates and related concerns. The Commission can approve and reject USPS proposals. Appointees to the Commission are selected by the U.S. President and confirmed by the United States Senate. The USPS publishes the Domestic Mail Manual, which outlines standards for letters, parcels, and other mail articles shipped within the United States. All articles of mail must comply with these standards when shipped within the country. Standards include maximum and minimum dimensions and weight, proper sealing and closure, how to use markings, restrictions on hazardous and restricted materials, and other guidelines. The delivery address must be left-justified and located more or less in the centre of the item’s largest side, while the return address must be places on the upper left corner. The USPS also publishes the International Mail Manual with similar standards for international services, including restrictions and conditions for sending items to specific countries. The price of sending items with the USPS depends on the type of mailing, the weight and dimensions of the item, and other applicable surcharges. The USPS does not deliver packages that are over 32 kilograms or 70 pounds, or with combined dimensions of greater than 270 centimetres or 108 inches (330 centimetres or 130 inches for parcels). Senders must generally use another service when sending a larger item, for example FedEx or UPS. The USPS offers both domestic and international services. The rate for sending a First Class Mail within the United States is $0.49 for the first ounce, as of 2014. Each additional ounce is charged $0.21. For large envelopes or flat parcels, the rate is $0.98 for the first ounce and $0.21 per additional ounce. Parcels and packages are charged $2.32 for the first three ounces and $0.18 per additional ounce. 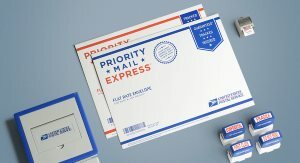 In addition to First Class Mail, the USPS offers Priority Mail Express for guaranteed overnight delivery to most locations and Priority Mail for non-guaranteed day-specific delivery within one to three days. Priority Mail is also available for First Class Mail and Standard Post for larger mail items and parcels. While delivery within the U.S. is handled by the USPS, delivery outside the country is generally carried out by local mail services. For example, in the United Kingdom delivery of items sent with the USPS will be delivered by the Royal Mail. USPS’s international services include First Class Mail International, which was formerly known as Airmail. This class of service includes small packages weighing up to 1.8 kilograms or 4 pounds. First Class Mail International rates start from $1.15 for sending postcards, envelopes and flat mail items. Rates for sending an item with USPS’s First Class Package International Service for parcels start at $6.55. Actual rates depend on the destination, dimensions and weight of the item. Delivery times vary depending on the destination. Other international services offered by the USPS include Priority Mai International, Express Mail International and Global Express Guaranteed. Priority and Express services can be used for sending items to almost every country in the world. Customs forms are generally required when sending all international mail, depending on the service level and the value of the item. 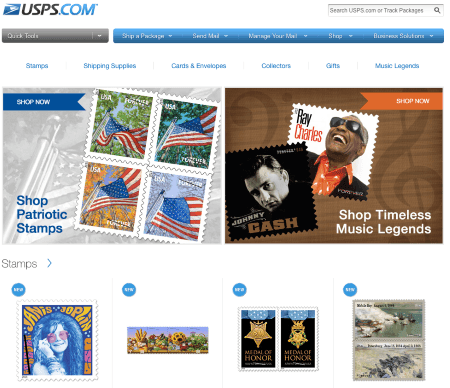 The USPS Online Shop provides a full range of postage and related products for sale. Standard and commemorative stamps are available for purchase from the online shop, as well as shipping supplies, cards, envelopes, collectors’ items and gifts. Custom postage can also be created and purchased online for personal use or as gifts. Discounted rates on stamps and other USPS products are typically available when using the USPS Click-N-Ship service. For example, Global Express Guaranteed is up to 13 per cent less than purchasing the service at a Post Office location. Similarly, customers can save up to 11 per cent on Priority Mail Express International rates and up to 13 per cent on Priority Mail International rates. 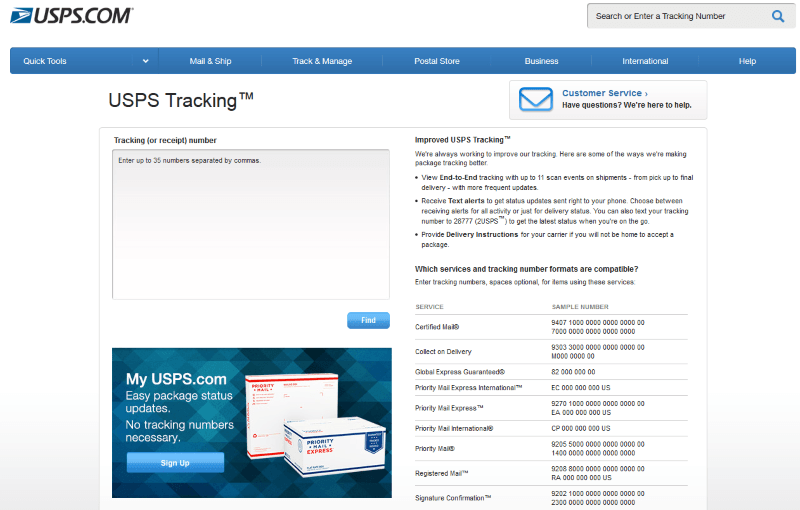 USPS Tracking is also available at a lower cost when ordering online. An USPS.com account is required in order to order and print shipping labels online. An account may also be used to request a package pick-up, buy stamps and other postal service products, manage P.O. boxes, print customs forms and file domestic claims. The USPS provides a range of services to businesses, including cost-effective shipping services and bespoke business solutions. Business may purchase mail products including stamps and shipping services with free USPS Tracking at discounted rates from USPS.com. Where available, free package pick-up and Saturday delivery in addition to free shipping supplies delivered directly to businesses. The USPS also offers Direct Mail services, which is targeted and customised to individual businesses. Most domestic and international services are available at discounted prices for businesses. The USPS provides three levels of service for businesses. A Negotiated Service Agreement offers the highest levels of discounts and is designed for companies that ship more than $1 million each year. The agreement creates tailored rates and services based on individual needs and requirements. Commercial Base and Commercial Plus pricing is available to high volume senders of lightweight packages. Commercial Base Pricing offers businesses basic discounts without a qualifying volume amount. Businesses simply register with the USPS. Commercial Plus Pricing is designed for shippers who send up to 5,000 First Class parcels or up to 50,000 Priority parcels each year. These senders qualify for discounted prices above Commercial Base Pricing. Priority Mail International is an affordable option when sending letters and parcels to more than 180 countries around the world. Delivery is typically within six to ten business days, depending on the origin and destination. Transit time between rural or remote areas may be longer. The service includes USPS Tracking and free package pick-up where available. Insurance cover may also be purchased to protect items for up to $5,000, depending on the destination country. Rates start from $29.25 at Post Office locations. The exact price will depend on the dimensions, weight and destination of the item being sent. The maximum weight for sending an item by Priority Mail International is 70 pounds. A Flat Rate service is also available for Priority Mail International. Free shipping supplies including envelopes and boxes may be ordered online or picked up at a Post Office location. When ready, the item can be dropped off at a mail box or at a local Post Office. Flat Rate Priority Mail International is available for large and medium boxes weighing up to 20 pounds. Flat Rate Envelopes and Small Flat Rate Boxes are also available for consignments weighing up to four pounds. Items send with Priority Mail Express International are generally delivered within three to five business days in most major markets. The exact delivery time will depend on the origin and destination of the item. Priority Mail Express International is available from $35.25 at Post Office locations. The service includes a variety of features, including free shipping supplies. Boxes, envelopes and other shipping supplies can be ordered online or at a Post Office. The service also includes USPS Tracking at no additional cost. Priority Mail Express International also includes up to $100 insurance cover for documents and up to $200 for merchandise, as well as free package pick-up where available. Additional coverage may be purchased for up to $5,000, depending on the destination country. Guaranteed date-certain service and money-back guarantees are offered when sending items to Australia, China, France (excluding Corsica), Hong Kong, Japan, South Korea, Singapore, Spain (excluding the Canary Islands) and the United Kingdom. 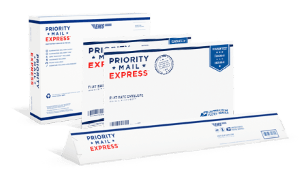 The Priority Mail Express Flat Rate option includes free envelopes and boxes for sending items to more than 180 countries. In addition to free shipping supplies, the service is available with no weighing or rate calculation when sending individual items. The envelope or box can be dropped off at a blue UPSP mail box or at a Post Office location. 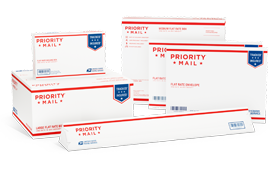 Priority Mail Express International Flat Rate Boxes are used for sending consignments weighing up to 20 pounds, while Priority Mail Express International Flat Rate Envelopes may be used for items up to 4 pounds. Global Express Guaranteed is the USPS’s fastest international service. Delivery is typically within one to three business days, depending on the destination. Items send with Global Express Guaranteed are delivered in partnership with FedEx Express. Rates start at $51.50, and prices depend on the size of the item and the destination. Global Express Guaranteed includes free package pickup, where available. The service includes USPS Tracking and $100 insurance cover, although additional cover may be purchased. USPS Mobile provides access to some of the most popular tools available on USPS.com. 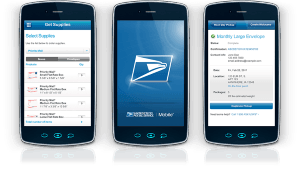 USPS Mobile is designed for Android, Blackberry and iPhone devices. The free mobile app allows users to find Post Office locations, including self-service kiosks, collection boxes and approval Postal providers. The app can also be used to calculate shipping rates, manage pick-ups and deliveries, and track items sent with the USPS. Users are also able to order supplies with USPS Mobile. The USPS has approximately 490,000 career employees and more than 137,000 non-career employees. This makes the agency the third largest employers in the United States, following the federal government and Wal-Mart. The USPS offers a range of benefits, including competitive basic pay rates and overtime compensation. Benefits include career development opportunities, annual leave starting at 10 days per year, sick leave, and health insurance through the Federal Employees Health Benefits (FEHB) programme in addition to traditional insurance coverage and Health Maintenance Organizations (HMOs) plans. Positions with the USPS are available across the United States and in a variety of fields. Job opportunities are available in administrative support, communications, consumer affairs, government and corporate affairs, delivery and customer service, engineering, facilities management, finance and accounting, human resources and labour relations, information technology and security, law enforcement and inspections, legal, sales and marketing, network operations and support, plant operations, pricing, product information, property and asset management, retail operations and support, supply management and procurement, and transportation and logistics. The USPS also employs individuals in various trades and technical positions. 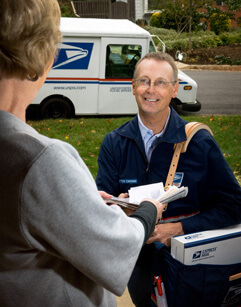 For more information about employment with the United States Postal Service and to find current vacancies, visit www.usps.com/careers. The United States Postal Service headquarters is located at 475 L’Enfant Plaza SW, Washington, DC, 20260-0004, United States. To find a local USPS location, visit www.usps.com/locator. The locator provides address details and contact information for Post Office locations and authorised service providers. To contact the USPS, call 1-800-275-8777. Alternatively, write to National Customer Support Center, United States Postal Service, 225 N. Humphreys Blvd., Ste. 501, Memphis, TN, 38188-1001, United States. To request more information, the USPS may also be contacted by completing an online form on USPS.com. I am waiting for a parcel from America. How do I organise a redirect, as although I can see that they say the have tried to deliver it they haven’t left me any information for me to pick it up or for me to try and organise a redeliver. My code is: LM988080527US. Thanks Nic. This tracking says delivered June 17th but my package still hasn’t arrived 3 days later. I am home all the time so could not possibly have missed it. Why does it say delivered?? Please look into this, I cannot call USPS from the UK. An item says it has been delivered to my address but I do not have my parcel and I there was no card or anything left. Can you advise on where it has been left or where I can claim a lost package? We can’t find any info on that shipment. Please could you check that the tracking details are correct and if the package is actually on its way to the U.K. The only reason I am writing this review, is that there appears to be no other way to contact USPS if you live in the UK, as your contact service requires US information. I have been tracking a shipment and 5 days ago everything stopped and I have no idea were my shipment is or when it’s due. The tracking number is LK136514518US. Can anyone help, or is your service really a shambles. My parcel from the us is now marked as delivered, But we have not received the parcel.WHAT NOW DO WE HAVE TO DO…..
well my parcel started in wisconsin and now is heading for mexico and i live in england figure that out good company or not ? LZ 194 956 965 US I’m curious why my parcel arrived in !London 5 December but went back to LA arriving back in london 7 December? My package	LZ538069275US is marked as delivered but I haven’t received it. At the time it was marked as delivered (7.20am Wednesday 9 November) I was not in. However, I returned at 12.40pm and there was no parcel and no card to say where it was. PS This is the only way I could find to contact you! USPS tracking does not work from the UK. I have the tracking number, from the parcel a friend sent me from the USA. All attempts to enter this number on your site gets me nowhere! “USPS Tracking® is unavailable for this product for UNITED KINGDOM”. Not sure what that means! I’m not allowed to track it as I live in UK, or it has left USA and reached UK?